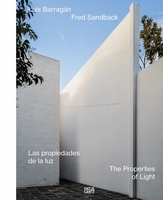 Hardcover, 10.5 x 12.5 in. / 208 pgs / 243 color. 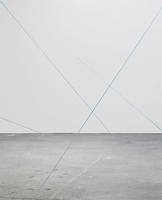 From the beginning of his career, Fred Sandback (1943–2003) used drawing to formulate his ideas of sculptural volume. 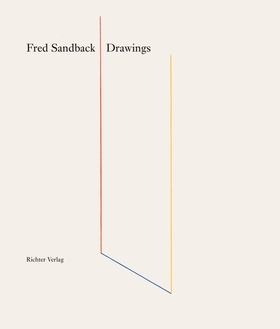 In pictures of existing rooms, Sandback explored the possibilities of spaces and planes by drawing his famous horizontal, vertical and diagonal lines in colored pencil. In the 1980s, he expanded his drawing repertoire to include acrylic, the pochoir technique and pastel. 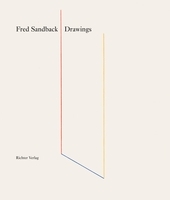 In these late drawings--considered to be more pictorial than his pencil sketches--Sandback elaborated on the experience of space, mass and volume in ways impossible in a coherent space: many of these sculptural ideas are absolutely boundless. 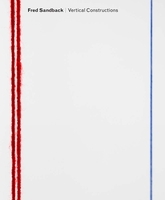 Only a specific section of the whole is intimated in the drawing, for which Sandback invented unusual techniques: actual incisions instead of drawn lines, for instance, or painterly traces on transparent film. Superbly produced and edited, Fred Sandback: Drawings assembles works from a 30-year span, supplemented by sculptural works. FORMAT: Hbk, 10.5 x 12.5 in. / 208 pgs / 243 color.